Like a few others, this shapeshifter class came into the world through the power of the Veilstorms. One of Arthur’s childhood friends, Menw, was touched by a Veilstorm. Though he appeared unchanged, Menw went into a deep coma. Over the next decade, his body was slowly encased in what looked like a moth’s cocoon. Over the next thirty years, the cocoon changed shape and color, before it finally cracked open, revealing an unchanged Menw. However, appearances can be deceiving. He had gained the power to change shape, and shared his gift with others. And so, the Guild of Enchanted Knights was born. To change is human, to truly transform, divine. Receives reduced healing and power from life buffs. When the user strikes another player who is more wounded than the user, the user’s damage is reduced. The longer the user remains in a single transformation, the greater the power of abilities used in that form, up to a capped amount. If the user is taking and dealing damage, the user’s power increases faster. The properties of armor and weapons equipped by the user have their stats incorporated into their transformations. These grant offensive and defensive bonuses relative to equipment quality and power. Transforms the user into the form of a Griffin, capable of bursts of speed and high slashing and piercing damage, while applying debuffs to the target. The immense claws of the Griffin rend armor and flesh, inflicting slashing or piercing damage and applying a stacking debuff that reduces the target’s armor class for a brief duration after each strike. A channeled series of piercing attacks that deal moderate damage, which increases with each successive strike. If the final strike successfully pierces the target’s armor, a bleed damage over time debuff is applied to them for a long duration. A heavy attack with a high stamina cost that deals slashing damage and causes bleed damage over time. If this attack strikes a wounded body part of an already bleeding target, it applies a debuff that increases subsequent damage to the same body part for a brief duration. Transforms the user into the form of a Basilisk, capable of inflicting debilitating diseases. Noxious vapor inflicts a poison debuff on the target, greatly reducing the amount of healing they receive and preventing their wounds from being cured for a brief duration. If the target receives a wound while the debuff is active, its duration is extended. A channeled effect that immobilizes the user, and reduces the movement speed and increases the ability preparation and recovery times of the target over time. The amount of time spent channeling and any damage dealt to the target during the duration increases the power of this debuff. Projects an effect, based on the Primary component used, in a small cone in front of the user, affecting enemies who are close and facing the user. Transforms the user into the form of a Demon, capable of dealing high damage and using buffs to add chaos damage to their attacks. Deals moderate direct chaos damage, and applies a brief chaos debuff that inflicts a small amount of chaos damage to the target each time they activate an ability. If used against Spirit enemies, its damage is increased. Directly applies an effect to a hostile target at medium range, based on the Rune component used. Stacking the same effect on the target increases the effect’s power and resets the effect’s duration. A powerful high-speed projectile with a high activation time that passes through characters in a straight line. On reaching its maximum distance or colliding with a non-character object, it then detonates over a small area, applying an effect based on the Rune component used with it to the closest enemy in range. Applies a buff to the user’s weapon that causes each successful subsequent weapon strike to apply an effect based on the Rune component used. Damage dealt by this buff increases its duration. The user quickly shifts forms, retaining the bonuses of their previous form, and keeping the power built up with Chosen Form in their new transformation. On death, the user’s hostile target is transformed into a mostly harmless bunny, with greatly reduced stats for a brief duration based on the power of their Chosen Form. 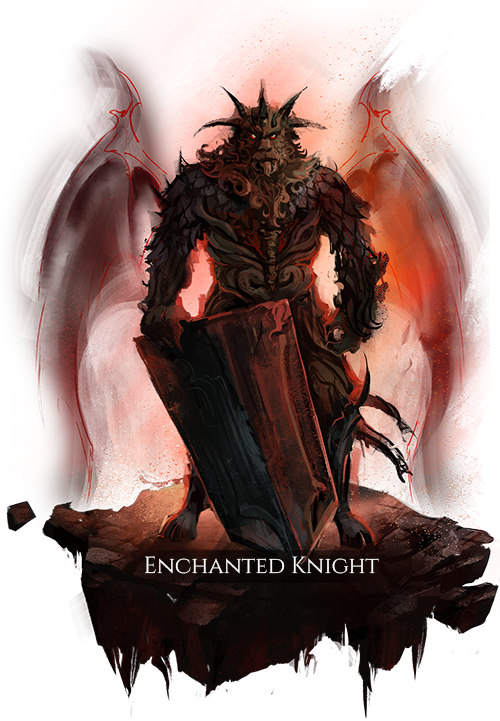 If the target is killed before the transformation expires, all nearby Enchanted Knights gain an equal amount of power to their current Chosen Form. If killed while in a transformation, returns the user to their normal body with full health. A chaos debuff is also applied that prevents the use of their previous transformation for a long duration.